Motivated by the prospect of conserving bat populations and species diversity, UC Santa Cruz researchers are investigating whether antifungal skin microbes can be used to help fight the deadly fungus that is causing a massive die-off of bats in eastern North America. The team, led by Winifred F. Frick (Porter, '98, environmental studies), a researcher in the ecology and evolutionary biology (EEB) department and A. Marm Kilpatrick, an EEB assistant professor, has received a $196,000 grant from the U.S. Fish and Wildlife Service. Joining them in the research are graduate students Tina Cheng and Joe Hoyt. The grant is part of a $1.4 million effort by USFWS to continue the investigation into white-nose syndrome that has killed more than 5.5 million little brown bats since it was first detected in 2006. White-nose syndrome has spread rapidly across the eastern U.S. and into Canada. Frick was a lead author of a 2010 study that identified the fungus that is killing the bats by disrupting their winter hibernation, causing them to awaken early and lose body fat before food sources become active. When healthy, these bats can consume their body weight in insects each night, Frick said. "Bats are crucial to our nation's ecosystems and our economy," said USFWS director Dan Ashe, calling the bat deaths "an unprecedented wildlife crisis." Frick said Cheng, a Ph.D. student in EEB, wrote the majority of the proposal "Antifungal Skin Microbes as Tools for WNS Management." It is inspired by similar work that has been done by researchers studying the fungus-caused deaths of a frog species in the Sierra Nevada. "We want to mitigate its impact on bat populations," Cheng said. "Our best bet for bat conservation is to find a way to give bats a fighting chance against the infection." Cheng received her master's degree in biology from San Francisco State University, working with professor Vance Vredenburg. 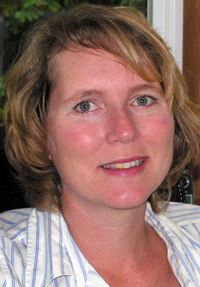 Vredenburg worked with collaborators at James Madison University to study the rapid die-off of the Sierra Nevada mountain yellow-legged frog due to a fast-acting fungus. They discovered and were able to show that augmenting a type of naturally-occurring skin microbe – Janthinobacterium lividum (commonly called J-liv) – to the frogs' backs resulted in healthier frogs that, though infected, were still able to survive. "It was a really huge breakthrough, the first glimmer of hope we could do something that would convey benefit to the frogs and prevent local extinction," Cheng said. She helped with the project and will be a co-author of the resulting paper. She also studied the decline and extirpation in the 1970s of a high-altitude salamander in Latin America, a task she compared with "Unsolved Mysteries." "You do a lot of detective work to try to go back and find what it was that caused these extinctions," she said. Cheng and others want to see if using the same antifungal skin microbe can empower the bat to resist the deadly fungus and prevent extinction. Cheng said the USFWS has tried using anti-fungal chemicals on the bats without success, and is now interested in finding a method that is more biologically friendly. Frick said the work involves doing laboratory experiments to identify bacteria or fungi that naturally occur on bat skin that could help inhibit growth and reduce the infection of the fungus that causes white-nose syndrome. Then they will conduct experimental trials to see if these microbial agents can increase survival of bats exposed to the infection. Cheng will work on the project as part of her doctoral thesis. Hoyt, an incoming master's student in EEB who formerly worked with the New York Department of Environmental Conservation, has already done preliminary work on microbes that inhibit the fungus growth. The project will be the topic of his master's thesis as well.